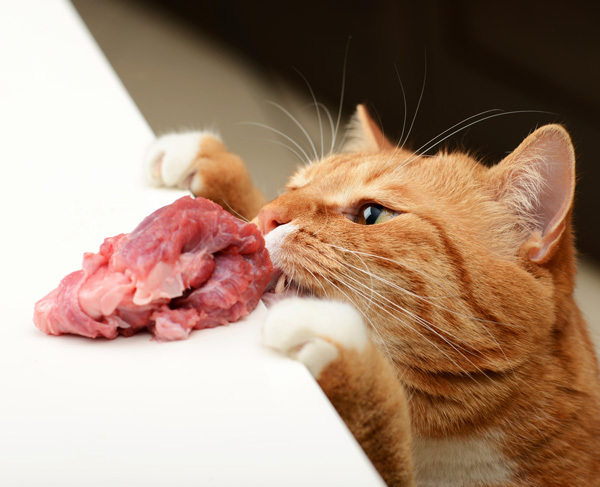 The choice of providing your cat raw meat will bring them closer to a diet they would get in the wild but can cats eat raw meat safely? 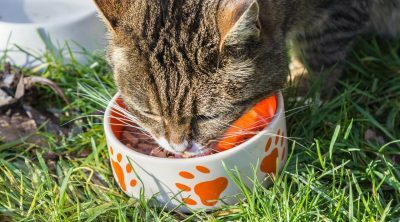 Raw meat can pose a lot of dangers since there are many types of bacteria that can cause problems but there are also some advantages to the commercial cat food out on the market today. This discussion has to be regarded from several aspects so let us start with the benefits your cat would get from a raw meat diet. 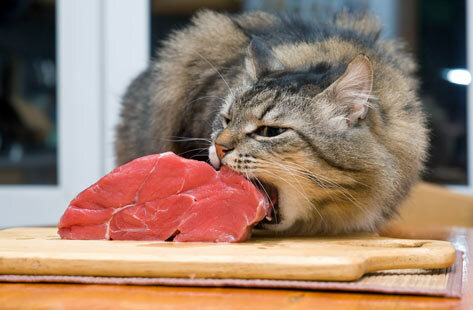 As predators, cats evolved by eating prey and this meant uncooked meat. When you cook meat a lot of the vitamins, minerals and amino acids are lost and that is even more true for processed meat cooked at very high temperatures. 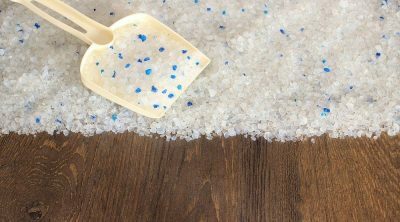 In those cases the nutrients have to be extracted and then added back in but this process is in no way perfect so the differences will be noticeable. Cats would eat the entire animal if it is small except for the intestines or larger ones but raw bone itself is their main source for calcium. The cooked bones can be very dangerous since they get brittle and can do internal damage. 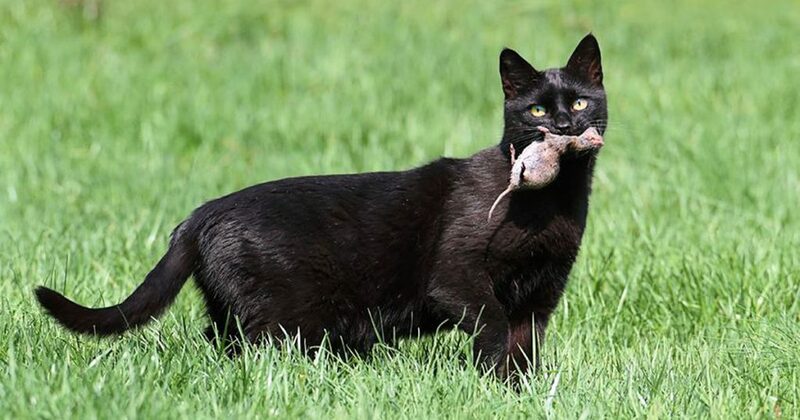 The most common prey for cats in the wild is small mammals such as rodents, birds, fish, snakes and other reptiles or even insects. So if you really want your cat to like as they did in the wild you should find some way of providing them with live prey although this will certainly prove difficult for most cat owners. Among the benefits raw food provides we should mention improved digestion, a healthy coat which will shed less and thus create fewer hairballs, more energy for your pet and their dental as well as their urinary healthy will be better. 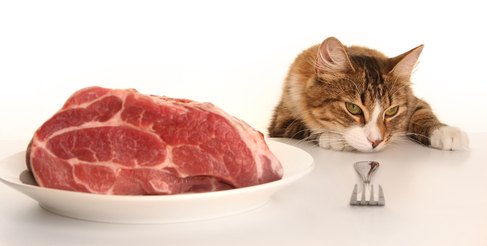 Raw meat will help cats stay fit so if you have an overweight cat a raw diet will balance their weight. 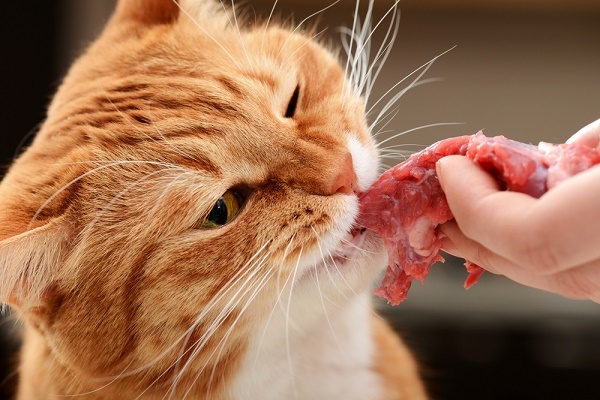 Chewing on raw bones, meat, connective tissue, skin and fur will help the cat’s teeth remain clean whereas carbohydrates create starchy films that will encourage gum problems and plaque. Cats do not need any carbohydrates in their diet and cannot digest them properly so a raw meat choice is much better than this since they lack the enzymes we have to assimilate carbohydrates. 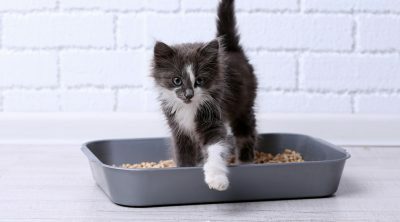 During the half of the 20th century, Dr. Francis M. Pottenger, Jr. has conducted a study which wanted to see the effects heat-processed food had on cats. His study was performed on cats donated by the clinic for this purpose and as his supply of cooked meat went down he started giving the cats raw meat scraps from a local meat packing plant. A few months after the cats received the raw meat scraps their health seemed to improve a lot and this is how his feeding study started, as well as one of the most frequently quoted arguments for raw diets. Between 1932 and 1942 the experiment included over 900 cats and their diet had 1/3 raw milk, cod liver oil, 2/3 raw meat and the control group received cooked meat instead of raw. The study discovered a direct link between the cooked meat and a lot of problems such as facial deformities in children, excessive parasites, various diseases and difficulties with pregnancies. Some veterinarians will warn you of the problems that raw food can bring such as salmonella, e coli, listeria or other bacteria but there are many who also consider this diet to be highly beneficial to the pet. The food-borne illnesses can also spread to the pet owners who prepare the food so make sure you take the appropriate precautions. Buy from trusted butchers instead of packed supermarket meat and use it immediately or freeze it in individual serving sized packs for later use. If you freeze the meat many of the bacteria will be destroyed and this is a procedure that is applied to raw food we eat such as sushi. Probiotics can reduce the risk of indigestion since they will enhance the health of the intestinal tract. Sterilize the cutting boards and food dishes after you use them as bacteria will multiply if left there. The food shouldn’t be left in a plate for more than thirty minutes so discard anything that the cat left and wash everything properly. 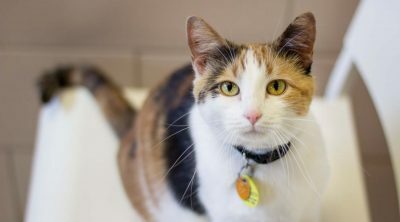 A veterinarian should be consulted if you intend to give raw meat to a cat who has problems with the body’s immune system and it is a good idea to ask them about this topic anyway. If you have a kitten then you can simply start feeding them raw meat but with adults they will require a period in which to adapt. 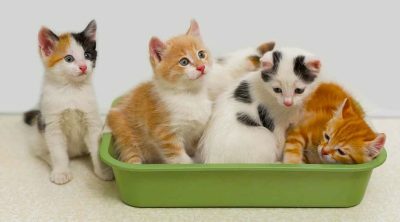 Kittens need to eat more often since their stomach is smaller and a meal around every six hours is recommended. For adult cats the duration of the transition varies depending on their health, how used they got to their food and other factors. It can take only a few days or it can take months so be patient. The cats seem to get addicted to dry food so it will be difficult to get them passed this step. But first we should get them used to eat at specific times. Two or three meals a day should be sufficient instead of always leaving dry food at their disposal. 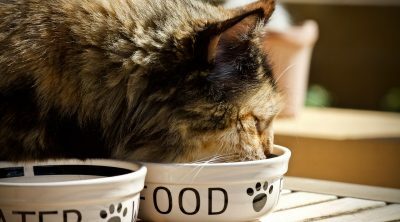 Cats should get used to the new routine fast when they are hungry and this will train them to prepare at regular hours for their meals. Make sure they eat but if they seem hungry that isn’t necessarily a bad thing since it will only make the food more appealing to them. Now try to stop feeding them dry food and change their diet to grain-free canned food. If they don’t like it at first try to serve them meat baby food and once they get used to the regular meal times and the canned diet it is finally time to switch to raw.